On Friday, May 24, 2013, a Washington State bridge in Skagit County collapsed after an oversized drill rig casing hit a bridge girder. The collapse came at the start of the busy holiday weekend. Governor Jay lnslee declared a state of emergency in the areas affected. Heavy traffic backup along Interstate 5 (l-5) was reported in both directions by midday Friday, May 31st, as cars and trucks inched along a cumbersome detour that took vehicles off the interstate and onto county roads. On May 31, 2013, Trooper Sean O’Connell was working traffic control on his motorcycle, assessing the backup on Fir Island Road, and was heading back to his post. Trooper O’Connell was traveling east on the shoulder of Fir Island Road towards the intersection of Greenfield Street when a box truck traveling in the same direction and attempting to make a right hand turn pinned Trooper O’Connell and his motorcycle against a guard rail. The box truck drug Trooper O’Connell and his motorcycle through the turn, knocking him off his bike. The box truck then ran over the motorcycle and Trooper O’Connell. Trooper O’Connell was taken to Skagit Valley Hospital where he died at approximately 1800 hrs. 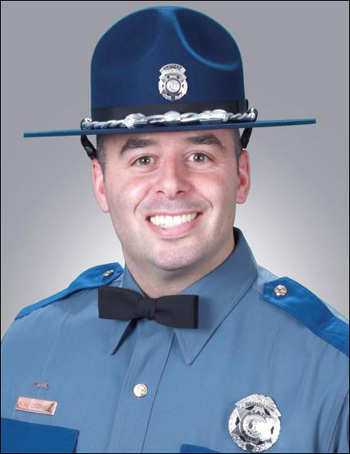 Trooper O’Connell served the Washington State Patrol for 16 years and was assigned to the Marysville district headquarters. Trooper O’Connell is survived by his wife and son and daughter.